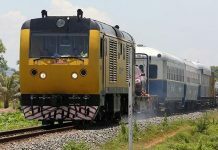 The UN Special Representative for Human Rights in Cambodia said Tuesday that he sees little im­provement in human rights since the Untac era, due to a large gap between the Constitution and the way Prime Minister Hun Sen exercises power. Despite the release of government critics from jail in January and the return of opposition leader Sam Rainsy in February, the hu­man rights situation has not fundamentally improved, Yash Ghai said at a press conference wrapping up his second mission to Cambodia. “In terms of the exercise of the power of the state, I don’t really see any great improvement,” he said. 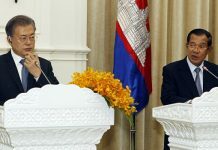 He noted that Hun Sen’s prom­ises to decriminalize defamation have yet to materialize, and added that a draft law dealing with protests may further constrict freedom of assembly. Hun Sen’s “iron fist” campaign has destroyed judicial independence, and the newly formed Na­tional Land Dispute Authority is unlikely to conduct investigations, he added. 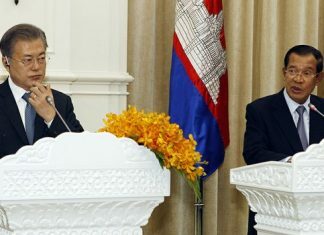 Although he said he was able to meet with Interior Minister Sar Kheng, Ghai, who hails from Ken­ya, said he would also have liked to have met Hun Sen.
“I am not aware of the reasons why I have not been able to see him, it may be that he has contempt for the office I hold or for the holder of the office,” he said. “Because I come from a poor country I believe I am well placed to advise another poor country,” he said, before calling on the international community to do more to pressure the government. “Donors have a moral obligation…. By giving large sums of money you are promoting the government in the eyes of the people,” he said. He added that the UN human rights office does nothing to train judges or draft laws, but sits back and complains. Referring to a clause in the new, France-assisted draft penal code that would keep defamation a criminal offense, Ghai accused both France and Japan of trying to maintain criminal defamation. He said both countries have asked him not to interfere in the drafting of the code. “I have prepared a new version of the defamation article but they refuse to incorporate it. They said it will interrupt the Cartesian logic of the French penal code,” he said. A Japanese Embassy official said Ghai lacks correct information about a draft civil code supported by Japan. He added that Japan has not taken a position yet whether defamation should be a criminal offense. A French Embassy spokesman declined comment.